This rigid, economical cardholder is a favourite. 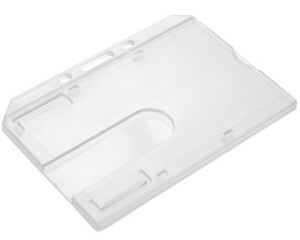 Our Clear Open Faced Standard Single Sided badge holders are made in the UK using recycled plastic (BIODEGRADEABLE) with holes for attaching various Clips or Lanyard. 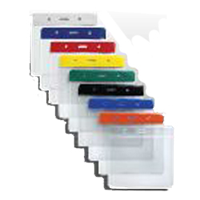 We also have available holders in a range of colours from stock. By far the most popular is the natural/clear holder to show 100% of the card design. ID Card Accessories. Available also in Black, Blue, Green, Natural, Red, White & Yellow. For double sided protection of cards. 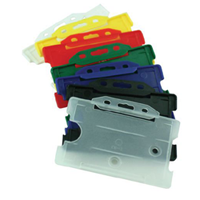 These hard, clear holders are made from a scratch resistant polycarbonate material. On the reverse of the holder is a tapered thumb slot to facilitate withdrawal of the card. The full face of the card is visible at all times. Particularly popular for outdoor use or by this with more physical pursuits. Available in Landscape or Portrait. ID Card Accessories. The ideal solution for carrying several cards. Will hold up to five CR80 credit card size cards. 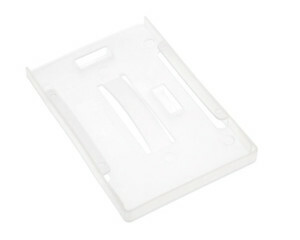 Strong spring clip ensures cards are securely held. Can be worn in landscape or portrait position. ID Card Accessories. Extra sturdy, crystal clear holder. Can hold one or two 760 micron cards. Comes with a thumb slot on the reverse for easy withdrawal of cards. The full face of the card is visible. ID Card Accessories. 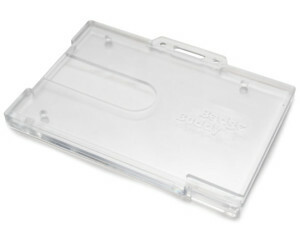 These clear Flexible Holders are made of a tough, welded PVC, with a slot ready punched for attaching a clip or lanyard. ID Card Accessories. 3 sizes are available to accommodate ID cards or Visitor passes. Visitor Pass. To take inserts up to 100 x 75mm CM331-5700. 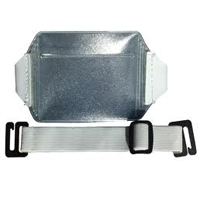 These clear flexible ID Card Armbands or License Armbands are made of a tough, welded PVC, with a Black elasticated adjustable strap for wearing on the top section of the arm. One size is available to accommodate ID cards or Visitor passes.